The fifteenth chapter of the Assessment of Climate Change in the Southwest United States, entitled “Human Health”, explores the current state of knowledge with regards to climate-related public health threats, such as respiratory ailments from dust and fire-related particulate matter, changes in disease transmission and risk, and heat-related morbidity and mortality. In this blog, I outline key findings from the chapter, and talk with Heidi Brown from the University of Arizona, one of the coordinating lead authors, to get her take on some topics not included in the chapter. Air Quality: Current knowledge of ozone and air pollution is inadequate to project future health impacts with any certainty. Rising temperatures will accelerate atmospheric chemical reactions which could increase ozone and particulate matter concentrations. But changes in other factors such as wind speed and relative humidity will also influence pollutant concentrations. Another impact of rising temperatures could be an increase in cases of allergies and asthma due to earlier and longer spring bloom for many plant species. The authors have the most confidence (medium-high) in the influence of wildfires, however. As wildfires increase in frequency and size due to climate change, they will increase particulate matter levels, subsequently effecting respiratory health (see figure). Smoke from wildfires increases particulate matter in the air, effecting respiratory health. Figure 15.5 of Assessment of Climate Change in the Southwest United States. 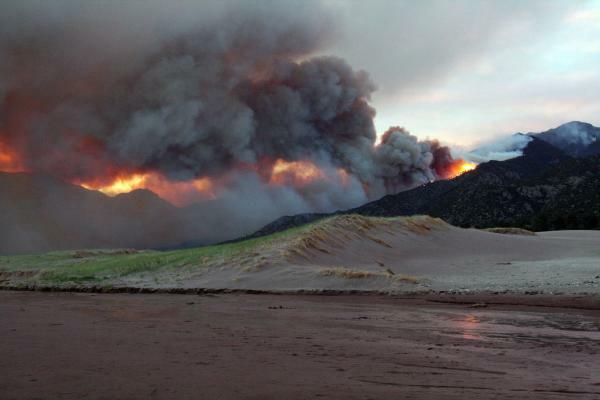 2010 Wildfire in Great Sand Dunes National Park, Colorado. © University Corporation for Atmospheric Research. Vector-borne disease: Diseases transmitted through a vector, such as mosquitos or fleas, will change significantly as climate warms. The life cycles of vectors are highly influenced by temperature and other climate factors through increased population growth and faster reproductive cycles, increasing the contact rate between vector and host. In addition, the ranges of vectors may change in the future, exposing some previously unexposed populations to new disease and no longer exposing some currently exposed populations. In addition to the topics above, the authors discuss adaptation and mitigation strategies. In particular they find that strategies tailored to the specific vulnerabilities of a region will lessen the health impacts of climate change described above. Another observation is that so far, the health sector has been more involved in adapting to climate change (through approaches such as surveillance and first-alert systems) than in mitigating it, however, evidence is increasing that certain mitigation policies also provide health benefits. For example, reducing greenhouse gas emissions will also reduce emissions of particulate matter and ozone, and reducing vehicle emissions by promoting walking and bicycling also improves the health of individuals. Brown: With respect to health: heat and heat-related illness, wildfires, and the uncertainty surrounding some of the other health issues. One of the more disconcerting scenarios is the idea of a long, hot, humid heatwave that coincides with a brownout, leaving the region without a means to cool off. Brown: Adaptive capacity: we have certain populations now who are without access to the medical care they need. Climate change will disproportionately affect these populations. Ensuring these populations and their needs are met will be one of the major challenges. On the other hand, public health response can be developed such that there is an immediate improvement for current health outcomes as well as developing future capacity. Brown: Public health is responding. Climate change is being incorporated into emergency preparedness planning. Coordinating across regions and responders while keeping the plans sensitive to the needs of individual communities will be one of the important challenges. Brown: There are a lot of interesting findings: the increase in heat-related illness resulting from more hot and more humid heatwaves, wildfires and the resulting respiratory illness, changes in disease distributions, to name a few. But what I find most interesting is how much better we've gotten at quantifying those changes. We're becoming more able to provide estimates of the magnitude of change expected. These numbers are particularly important for planners. Brown: My expertise is vector borne disease and there is still a lot of work to be done in understanding how vector borne disease will change. Will they move into or out of regions? Will the season start earlier or last longer? That said, one of the areas I find most interesting from this report is the movement for public health to become involved in mitigation. The ideas that things like promoting bicycling to reduce emissions, with the benefit of also having a positive influence on health and helping to combat the obesity epidemic, is an impressive thing for a public health person like me to hear. Figuring out how to incorporate this notion and to put some cost on it will be a very interesting task. In our next blog we’ll focus on the energy system and how climate change may impact it. Vince Tidwell from Sandia National Laboratories and coordinating lead author of the energy chapter will provide his insights.